Three NHS and social care organisations are planning the future of Calderdale’s mental health rehabilitation and recovery services. Only two of them have explained their proposals to Councillors on Calderdale Council’s Adults Health and Social Care Scrutiny Panel. They want to cut beds and put patients into their own homes with unclear “support” in the community. If you are affected by these proposals, please contact Plain Speaker. Research shows that cutting mental health beds puts patients at increased risk of suicide. impact assessments on patient care and staff. At the 8th September Scrutiny Panel meeting, the mental health Trust and the Council’s Rehabilitation and Recovery Service both presented proposals to cut mental health rehabilitation and recovery beds – although these vital beds are already in short supply. Due to current bed shortages, 11 Calderdale patients are currently in rehab and recovery placements outside our district or in private facilities in Calderdale. A further 53 from Kirklees and Wakefield have also had to go outside their districts. But John Keaveny from South West Yorkshire Partnership Foundation Trust (the mental health trust) outlined plans to close 3 SWYPFT rehabilitation and recovery units across Calderdale, Kirklees and Wakefield, with the loss of 56 beds between them. The plan is replace them with one 20 bed unit to serve all three areas – without specifying where. This means losing a total of 36 beds. 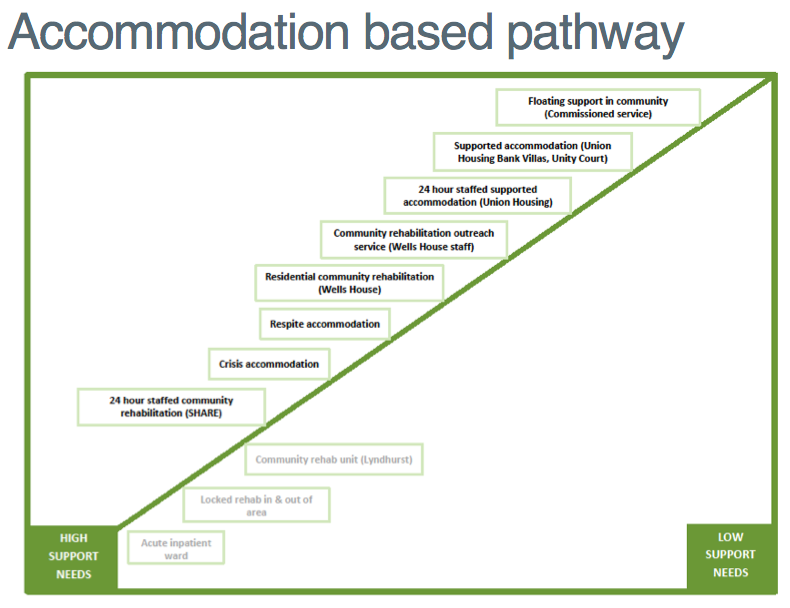 Both SWYPFT and the Council’s Rehabilitation and Recovery Service aim to move patients out of rehab and recovery accommodation into their own homes, supported by ‘a flexible community offer’ – whatever SWYPFT might mean by this jargon. The Council proposes that mental health patients will pay for this community support using means-tested personal social care budgets and non-means tested personal health budgets. At the moment there seems to be no public information about where South West Yorkshire Partnership Foundation Trust (SWYPFT) plans to put the new 20 bed unit. Wherever the new 20 bed unit might be, this doesn’t sound like care closer to home – it sounds like care a lot further away from home for many people. Recent research has shown that sending mental health patients out of area increases the risk of suicide on discharge and should stop. “Research shows that people recover best and quicker when in their own location, as family and friends can visit. Also people who have been admitted to residential stays have been triggered by an event; it’s been shown that moving people out of their location is detrimental to improvements in their mental health, as attachment problems are also then triggered. Is the “purchaser” at odds with the “provider”? 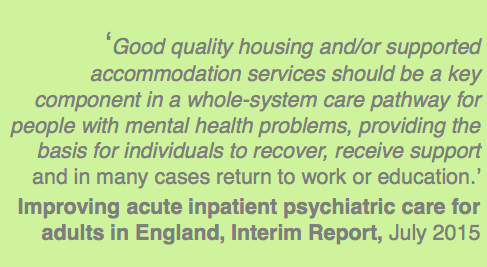 Lyndhurst – SWYPT’s 14 bed rehabilitation and recovery unit in Elland – is “out of scope” (not included) in the Council’s rehab and recovery plans, according to Libby Smith, the Council’s Rehab & Recovery Service manager. This is because no one knows if Calderdale Clinical Commissioning Group – the “purchaser” of mental health services for the NHS – will agree with the proposed SWYPFT bed cuts in Calderdale, or buy beds in SWYPFT’s proposed new unit. As the CCG doesn’t want to cut local bed numbers, it seems unlikely to want SWYPFT to close Lyndhurst. Libby Smith told Plain Speaker that she thinks the Lyndhurst unit may stay open for up to five years, but that uncertainty about the future of Lyndhurst means equal uncertainty about the future of Wells House (a Council-run residential community rehabilitation unit in Sowerby Bridge), and other Council rehabilitation and recovery accommodation. These currently house 59 people. “I don’t know about the future of Wells House, I don’t know if it will keep beds open, I don’t know what it will look like. We had a workshop with stakeholders this morning and the next step is to draw up the services specification to go to Cabinet in November with proposals to consult. 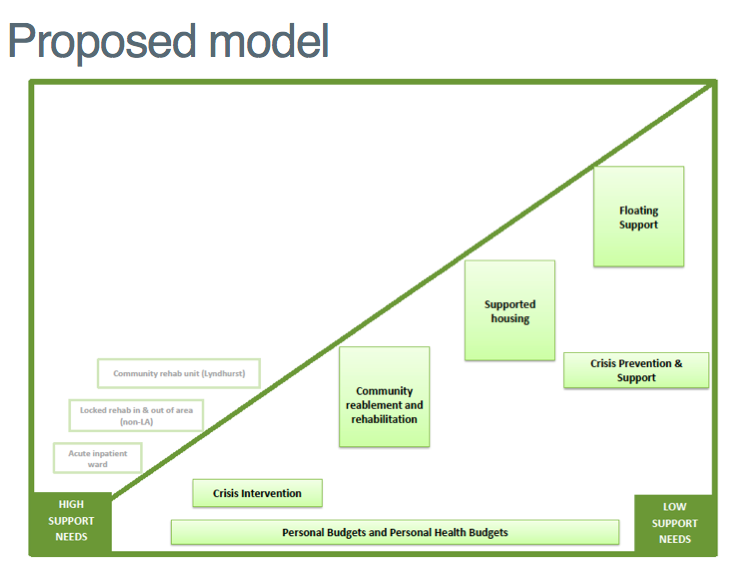 If SWYPFT were to close Lyndhurst regardless of the CCG’s plans, Calderdale CCG would probably aim to pay for private sector beds in Calderdale, such as Cygnet Lodge in Brighouse and Richmond Fellowship, Moorview. The CCG already uses private beds in Calderdale when there are not enough SWYPFT and Council rehab and recovery beds. Use of these private beds is included in the figures for patients who are in “out of area” facilities. “I’m not sure whether the Panel was aware that SWYPFT is proposing to cut the Rehabilitation and Recovery Beds across Calderdale, Kirklees and Wakefield from 56 to 20. I find it very strange that none of the members on the Panel questioned this drastic cut nor asked for good evidence to show that it is appropriate. Rehabilitation and recovery is clearly a stage that starts before a person returns from inpatient treatment into the community, to live on their own. It appears that it is used for individuals who are returning to their locality after an in patient admission in an acute ward, often out of area and possibly of a secure nature, or in some instances it may be used to prevent or treat relapse (crisis/respite care). I find it very hard to believe that a population as large as SWYPFT’s can manage with only 20 beds of this kind across the whole of Calderdale, Kirklees and Wakefield. The first thing that the Scrutiny Panel should have asked for is the evidence data showing the clinical need to close rehab & recovery beds and replace them with care in the community. And then they should have asked for the assessment of how the proposed changes will affect patients’ health, and staff working conditions and terms of employment. What has the Scrutiny Panel decided? Plain Speaker is confused over the outcome of the Scrutiny Panel meeting. It is hard to see how the Scrutiny Panel can have reached this agreement before the three Scrutiny Panel chairs have made up their minds about the SWYPFT plans. What is going on? The South West Yorkshire mental health Trust, Calderdale Council’s Rehabilitation and Recovery Service and Calderdale Clinical Commissioning Group all have administration, planning, procurement and contracting costs. These take money away from patient care and clinical staff salaries. Surely this triplication and fragmentation is a waste of resources – particularly given the dire shortage of money in the NHS and social care, as a result of government underfunding. It is also is a recipe for confusion, fragmentation, waste and lack of democratic accountability. setting up local and national commissioning bodies that are required to buy services through competitive tenders that are open to private health companies as well as NHS ‘providers’. All this while defunding the NHS through imposing huge “efficiency” cuts and flat funding, while also slashing Council health and social care spending. Not to mention the loss of at least £4.5bn/year to the costs of NHS marketisation and privatisation. There is one clear way out of this mess, that damages patient care and staff working conditions and terms of employment. This is to pass the 2015 NHS Reinstatement Bill, to restore the the system that once worked so well but now is crippled. This Bill is simple and elegant in its vision of a fully restored, public health service that reinstates the NHS in order to maintain the health and wellbeing of an entire nation. It is designed to end the purchaser-provider split, reverse NHS privatisation and marketisation and resolve the PFI rip off. The Bill includes a process for doing this without another top down reorganisation. It gives flexibility in how it would be implemented, led by local authorities and current bodies. Its second reading is due on Friday 11 March 2016. Please ask your MP to vote for it, whatever their political party. A 2013 YouGov poll found that 84% of the public want a fully nationalised, publicly owned and run NHS – and this includes 77% of Tory voters and supporters. Updated 18 Sept 2015 with new information from SWYPFT. This entry was posted in Social fairness and tagged Adults Health and Social Care Scrutiny Panel, Calderdale Clinical Commissioning Group, Calderdale Council, mental health, mental health bed cuts, SWYPFT by jenny. Bookmark the permalink.